I make this on special occasions. Delish! This is very rich!! And a change from the typical semonlina sheera..Good for some special occasions. Have you used tinned pineapple or a fresh one? Love this pineapple kesari, feel like having few spoons rite now..yumm! 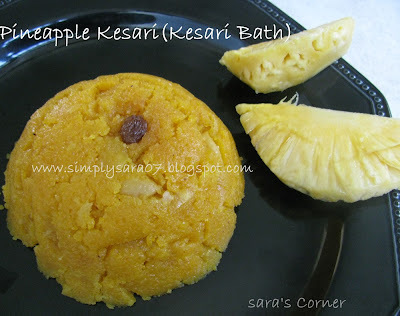 yummyy ..my fav kesari.looks so delicious..
pineapple, my favorite! !...looks so yummy and tempting! Very interesting adding pineapples to semolina...luks tempting. I am crazy about this dish! Thanks for sharing the recipe. Dear Friends, Thank you for your comments..
Hi Deepa, I have used fresh ones, You can also use tin ones. Delicious dear! If you wish send this to my FIL-Fruits event da!